2018 marks the 250th anniversary of the modern circus, and throughout most of April CircusFest is happening in London, which ‘…celebrates the future of circus: daring and diverse, punky and poetic’. The Round House is hosting most of the events, along with other partner venues, for a list of the spectacular events on show see here. One of the partner venues is the V & A, who’s Friday Lates late special on 27th of April has a circus theme, where you can take part in workshops, see rarely seen items from the V & A archives and watch live performances. The V & A holds a large Theatre and Performance Collection and archive, and as well as hosting CircusFest Friday Late, they also have The V & A Performance Festival, opening on April 20th, with a theme of Censorship and Circus. One of the events includes a performance by The Bookshop Band who’s music explores censored literature from the V & A archive among other forbidden authors, which takes place in the V & A Library. 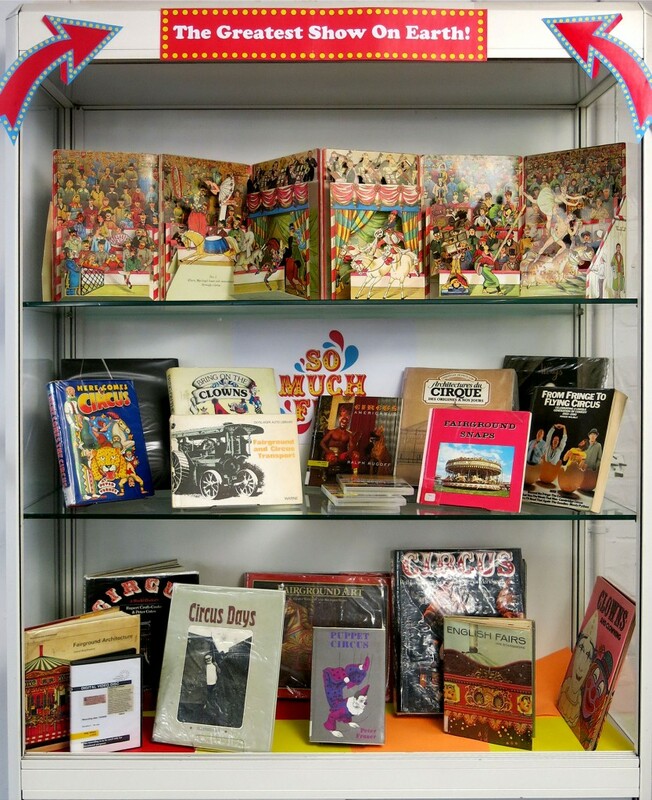 To commemorate the circus theme, Aldgate Library has a display of some of its circus themed books, which includes a great pop up book – ‘International Circus’ – a reproduction of the antique book by Lothar Meggendorfer. I have tried to find where there is a copy of the original 1887 version, and a quick look on MetCat (which can search libraries world over) reveals Yale, Illinois and California hold copies! You can also find a copy of The Circus 1870 – 1950 by Noel Daniel, published by Taschen in our Special Collections Oversize – which at 46 cms is one of our largest books in the collections! London Met Libraries also subscribes to Nick Hearn Books, a vast collection of plays, screenplays and theatre books – a great resource for our Theatre and Performance students, as well as other related courses. Log in with your university username and password through the library catalogue. This entry was posted in art collections, Databases, event, events, Exhibitions, Library books, Library e-resources, Library news, Uncategorized and tagged "art history", "Art Library", art, books, CASS, events, exhibitions. Bookmark the permalink.